My father was a respected Mount Pearl teacher but as well quite a good poet. He was published in the Newfoundland quarterly several times. I remember him writing poetry lying on the living room floor into the wee hours of the night. My mother started writing music on piano around 1978. Her compositions are clever in their sometimes melancholy and reflective moods but with the use of major chord sequences(tin pan alley style). As recently as 2007 she won the NL arts & letters award for music composition, receiving a standing ovation at the rooms when the quartet performed the piece. I listened to both Cat Steven’s Teaser and the fire cat album & Miguel Regas singing Beethoven’s Ode to Joy while leaning over my parents couch at 3 years old. I was never overly fond of my musical experiences in the school system. I was expelled from a music class at one point for talking and not paying attention (ha!) but did (along with Jay Campbell and Trevor Fraize) manage to win the Kiwanas division that year for the school band. “All because of the percussion section” as the adjudicator said. (ha!). I started playing guitar when my dad invited a neighbor and guitar player over (Keith Green) to play some April Wine songs in our back yard. He and my dad were the reason I started playing guitar. Likely my lack of interest in too much of the formal musical status quo got me writing my own compositions early. Thankfully my parents enrolled me in private music lessons with various inspiring teachers. My drum teacher Buddy Pennington was my biggest early influence. He instilled a love of good drumming which I think is quite evident on all my albums. Ward Pike, my guitar teacher was a significant early influence too. He helped explain applied guitar theory to me and he was inspiring to watch play. He recorded my first original band’s (Graffiti) album also. 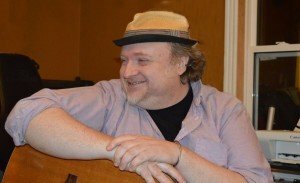 My classical guitar instructor Michael Ouler encouraged my love of simple classical guitar pieces and finger style that has remained within my technique. 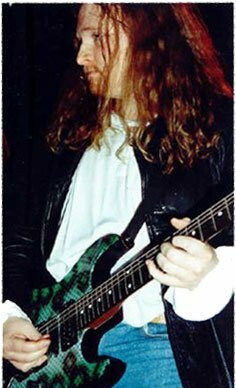 I had good private music teachers and I went on myself to teach at Discover Music school, Griffith’s guitar works and at MUN adult extended learning. I’ve taught hundreds of students guitar, bass and a little percussion & songwriting and singing over the years. My first cover band “Anderson’s Council” was fronted by Jay Campbell and Terry Parsons as well Rob Vallis on guitar and Wanda Milley in the band singing lead. After that we changed our name to “Graffiti” with Cindy Walsh on lead vocals. We played gigs around St. Johns & outport Newfoundland. Both Jason and Terry have original albums out as “Missing Signals” & “Small Town” respectively. A little later lineup would of been Azriel St.Michael on lead vox and John Thistle on second guitar. Dion, Roger & Azriel were writing songs way back then with me and they have since gone on to significant solo songwriting careers themselves. John Thistle is now an academic writer. Back then he co-wrote the song “Treehouse” which along with my father’s lyrics, I’m covering on my new album. Fred has become an accomplished drummer and drum teacher. He has played on 80% of the songs on my albums since then and his drumming has become an integral part of my sound. In Vancouver I continued with Graffiti (or newer version called Rambler). Then with Waterville with Ed frey (drums) Harley Sadlo (keys) until 1996. Soon after recording this album my father took ill with a stroke. I decided to come back to St. John’s to spend time with my parents. I continued to play live original gigs (often 3 sets of my own songs) at places like the Ship Inn, The Rose and Thistle, & the Fat cat. One gig in particular where Ron Hynes asked me to open for him at the Ship. As well I would often open solo acoustic at many of the Rose and Thistle open mics hosted by Chris Ledrew from 1999-02. From 2000-08 I played bass in the local Greek band “The Forgotten Bouzouki”. The bands leader George Miminis introduced me to a whole other world of music. It has inspired me to use other less familiar music scales and passing tones. In that band I got to play along side with Newfoundland music legends Pam Morgan and Dave Panting. In 2005 I started writing & recording my 2nd album “Souvenirs” which was a double Cd. I hired quite a few of the great local St. John’s players to help complete my album vision. It was mixed by Vic Florencia who recorded Sarah Slean, Miley/Billy Ray Cyrus, Coney Hatch, Cory Tetford, Barry Canning and local Newfoundland band Timber etc. The art work was beautifully rendered by Tony Mitchell of Original Mix Design and includes a large poetry book inside with my lyrics. Brian Way (key board) and Chris Sooley (bass)were heavily involved with that album as well. John Hutton from Billy and the Bruisers was a great help at promoting it locally in St. John’s. I continued playing my original music live till about 2010 with various local players Tim Yearman ,Dave Vivian , Mike Hickey ,Fred Norman,John Ennis and most recently Joe Dominix. Around this time I had to stop performing as I started experiencing dizziness/vertigo on stage and while walking. I decided because of this to concentrate on my third album recording “Forever Run“. This album was recorded/mixed by the fantastic St. John’s sound engineer Don Ellis. Shortly after this my health was further bothered by unexplained symptoms. It turned out to be an Arnold Chiary malformation in upper neck/brain. In 2014 after the diagnosis, I had brain surgery which partially corrected the problem but my right side (strum hand) and right leg nerves were moderately (but permanently) damaged. All said I’m doing very well and have recovered the best I can. My singing voice I think is strong now and I have a good vocal coach Melanie O’Brien. She has sung bgs on my new album along with Percy McDonald. If I’ve left a story or two out (or some important people) in this musical journey I do apologize. It would be easy to write a book when writing these things and I think I already have! I’m now more driven then ever to release my new album “Cavalcade”. It will be out before 2016. It was recorded by my good buddy and great engineer Rick Hollett. It will be mixed by him and several other world class mix engineers very soon. I hope you all enjoy and you can check the news section for updates.